ca. 7000 B.C. - 200 A.D. The Middle East was the cradle of mankind's first advanced civilizations. In Egypt and the Fertile Crescent, which extends in an arc from the north of the Arabian Peninsula east through Palestine to Mesopotamia, the first state structures emerged in parallel with the further development of animal husbandry, agriculture, trade, and writing. The first great empires, such as those of the Egyptian pharaohs, the Babylonians, the Assyrians, and the Persians, evolved at the beginning of the third millennium B.C., out of small communities usually clustered around a city. Similar development also occurred on the Indian subcontinent and in China, where quite distinct early advanced civilizations took shape as well. showing the pharaoh in a ceremonial robe decorated with the heraldic animals, the vulture and cobra, ca. 1340 B.C. Although China was one of the first places of human habitation, its civilization is relatively young compared with other ancient high cultures. In the third millennium B.C., the first communities with a sophisticated civilization began to emerge. From around the 18th century B.C., the ruling Shang and Zhou dynasties centralized power and presided over a period of considerable technical innovation. The empire perceptibly decayed from the eighth century B.C. on and finally ended in a war between its constituent parts. 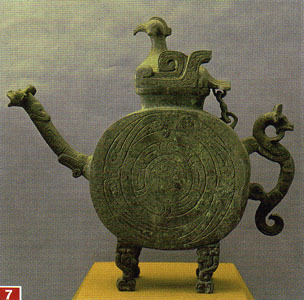 Even the earliest cultures in China produced great technical achievements. These early people and their rulers would later be much celebrated and attain a mythical status in Chinese history. The 2 "Peking Man" is among the oldest hominid finds made in China. 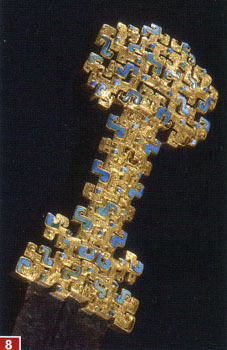 His remains were found in a cave near Beijing (Peking) and are between 300,000 and 400,000 years old. Subsequently, remains of a 700,000 year-old hominid were discovered near Lantian. Cattle breeders and farmers are known to have settled in villages along the larger rivers in China as early as the Neolithic period. 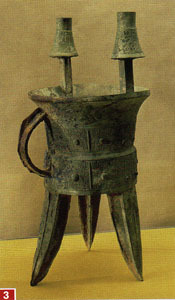 One of the cultures of this period was the Yang-shao culture (ca. 5000 B.C.) 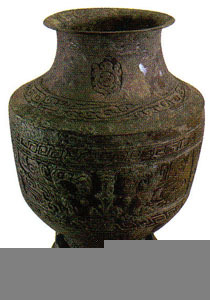 in northern China, which produced significant pottery. Around 3000 B.C. 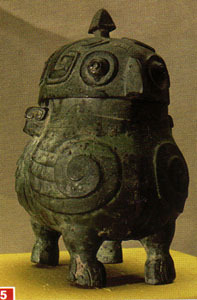 the group was supplanted by the Lung-shan culture, which was characterized by permanent settlements and technical refinements for predominantly domestic purposes. In Chinese tradition, the first state was formed at the end of the third millennium B.C. According to mythology, it was ruled by the sage-kings Yao, Shun, and Yu. They are said to mark the arrival of civilization, particularly through innovations in agriculture and management of water resources, in the region. Yu is credited with founding the Xia dynasty, which gave way to the 1, 5, 6 Shang dynasty at the start of the Chinese bronze age around 1800 �.c. 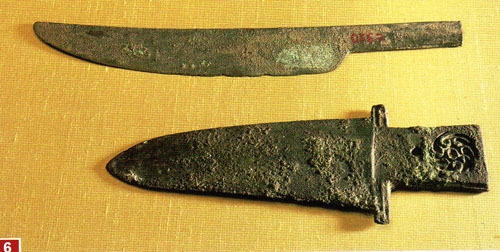 During the period of the Shang dynasty (ca.1766-1100 B.C. ), the emperor became the political and cultural leader. He was considered the "representative of heaven" and surrounded himself with a great caste of priests. Permanent walled cities were built, some of them at amazing expense, with palaces and temples. The emperor often shifted his 3, 4 richly-appointed residences. The houses of tempered clay had subterranean storage rooms for food supplies. Among the many technical advances developed in this period were polished ceramics, the farming of silkworms, spoke-wheeled wagons and the plow. The Shang script, pictographic with more than 3000 characters, is a direct predecessor of the modern Chinese writing system. 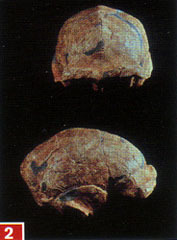 2 Skull of the "Peking Man"
use with the inscription "Father Chi"
The Zhou Dynasty and the "Warring States"
The victory of the Zhou dynasty over the Shang ushered in important changes in China's social structure. The feudal system that developed precipitated a decline in central political authority as regional states asserted their autonomy. The Zhou, who ruled a small kingdom in the west of China during the Shang dynasty, defeated the Shang around 1050 B.C. and assumed power. They ruled their vast lands through vassals, awarding land to loyal clan chiefs and above all to their family members. Thus historians have traditionally ascribed the emergence of China's characteristic feudal system to the Zhou period. The decentralization of power inherent in this system paved the way for the later formation of more than 1000 "small nations" under the autonomous rule of the local elite. The period also saw traditional social divisions solidify into feudal ones, between the nobility, the military caste and the administrators on the one hand and the serf farmers and craftsmen iihe overwhelming majority) on tin other. The Zhou are also credited with introducing the concept ofa "mandate of heaven," whereby emperors ruled by divine right. Tin political fortunes of the Zhou dynasty can be divided into two phases. 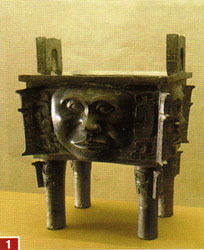 During the first, known as the 7, 9 Western Zhou period (ca. 1050-771 �.�), a strong central government ruled. During the second, known as the 8, 10 Eastern Zhou period (771-ca. 256 B.C. 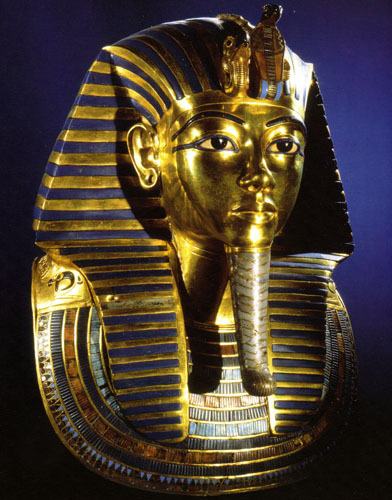 ), only a puppet ruler, or symbolic figure, remained. He had no real power and was manipulated by rival regional lords. Some sources divide the Zhou dynasty into three phases: the "Early" period (771-722 �.�); the "Spring and Autumn" period (722-481 �.�), in which a few larger, autonomous vassal states developed; and the period of the "Warring States" (481-221 B.C. ), which takes its name from the Book of the Warring States written during the later Han dynasty. A period of forced consolidation left seven large states to fight for dominance over China's vast territories. Although marked by violence and war, the period was also notable for its intellectual and technological advances. Perhaps most significant was the transition to a more intensive use of agricultural land, including the introduction of new varieties of crop, in particular rice and wheat. Irrigation techniques and road construction methods were substantially improved, and knowledge of ironworking spread. The period of the "Warring States" was also the golden age of classic Chinese philosophy. It ended with the establishment of the Qin military state. 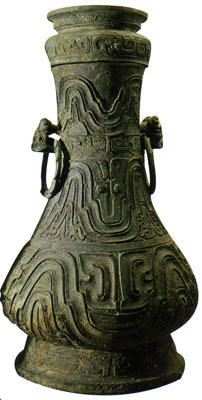 Eastern Zhou dynasty, 771-ca. 256 B.C. In the shadow of the rival lords' conflicts during the period of the Warring States, a number of philosophical schools developed! Almost all of these schools took a position on political questions and endeavored to gain the favor of the rulers. Sine of these schools eventually came to dominate. Among them were the School of Literati (Confucianism); the Taoists; the Mohists, whose moral code shows many parallels with utilitarianist thought; and the Legalists, who advocated strong leadership with strict legal controls. Legalist teachings became state dogma under the Qin dynasty while Mohism died out. The Hundred Schools of Thought (traditional Chinese: 諸子百家; simplified Chinese: 诸子百家; pinyin: zhūzǐ bǎijiā; Wade-Giles: chu-tzu pai-chia; literally "all philosophers hundred schools") were philosophers and schools that had flourished from 770 to 221 BC, an era of great cultural and intellectual expansion in China. Even though this period, known in its earlier part as the Spring and Autumn period and the Warring States period (春秋戰國時代/春秋战国时代) in its latter part, was wrought with chaos and bloody battles, it is also known as the Golden Age of Chinese philosophy because various thoughts and ideas were developed and discussed freely. This phenomenon has been called the Contention of a Hundred Schools of Thought (百家爭鳴/百家争鸣; bǎijiā zhēngmíng; pai-chia cheng-ming; "hundred schools contend"). These thoughts and ideas have profoundly influenced lifestyles and social consciousness up to the present day in East Asian countries. The intellectual society of this era was characterized by itinerant scholars, who were often employed by various state rulers as advisers on the methods of government, war, and diplomacy. This period ended with the rise of the Qin dynasty and the subsequent purge of dissent. Confucianism (儒家; Rújiā; Ju-chia; "School of scholars") is the body of thought that arguably had the most enduring effects on Chinese life. Its written legacy lies in the Confucian Classics, which later became the foundation of traditional society. Confucius (551�479 BC), or Kongzi "Master Kong", looked back to the early days of the Zhou dynasty for an ideal socio-political order. He believed that the only effective system of government necessitated prescribed relationships for each individual: "Let the ruler be a ruler and the subject a subject". Furthermore, he contended that a king must be virtuous in order to rule properly. To Confucius, the functions of government and social stratification were facts of life to be sustained by ethical values; thus his ideal human was the junzi, which is translated as "gentleman" or "superior person". Mencius (371�289 BC), or Mengzi, formulated his teachings directly in response to Confucius. -Mozi accepted certain basic Confucian prescriptions, like the superiority of the ancient sage kings who had attained righteousness, yet he felt that Confucius overemphasized bonds with acquaintances and relatives. -Mozi argued that each individual had an obligation toward all the other people in human society -individuals simply had to consider how their actions would affect everyone in society, not just the people they knew personally. The effect of the combined work of Confucius, the codifier and interpreter of a system of relationships based on ethical behavior, and Mencius, the synthesizer and developer of applied Confucianist thought, was to provide traditional Chinese society with a comprehensive framework by which to order virtually every aspect of life. There were many accretions to the body of Confucian thought, both immediately and over the millennia, from within and without the Confucian school. Interpretations adapted to contemporary society allowed for flexibility within Confucianism, while the fundamental system of modeled behavior from ancient texts formed its philosophical core. Diametrically opposed to Mencius, for example, was the interpretation of Xunzi (c. 300�237 BC), another Confucian follower. Xunzi preached that man is not innately good; he asserted that goodness is attainable only through training one's desires and conduct. The School of Law or Legalism (法家; Fǎjiā; Fa-chia; "School of law") doctrine was formulated by Han Feizi (d. 233 BC) and Li Si (d. 208 BC), who maintained that human nature was incorrigibly selfish; accordingly, the only way to preserve the social order was to impose discipline from above, and to see to a strict enforcement of laws. The Legalists exalted the state above all, seeking its prosperity and martial prowess over the welfare of the common people. Legalism greatly influenced the philosophical basis for the imperial form of government. During the Han Dynasty, the most practical elements of Confucianism and Legalism were taken to form a sort of synthesis, marking the creation of a new form of government that would remain largely intact until the late 19th century. Philosophical Taoism or Daoism (道家; Dàojiā; Tao-chia; "School of the Way") developed into the second most significant stream of Chinese thought. Its formulation is often attributed to the legendary sage Laozi ("Old Master"), who is said to predate Confucius, and Zhuangzi (369�286 BC). The focus of Taoism is on the individual within the natural realm rather than the individual within society; accordingly, the goal of life for each individual is seeking to adjust oneself and adapting to the rhythm of the natural (and the supernatural) world, to follow the Way (tao) of the universe, and to live in harmony. In many ways the opposite of rigid Confucian morality, Taoism was for many of its adherents a complement to their ordered daily lives. A scholar serving as an official would usually follow Confucian teachings, but at leisure or in retirement might seek harmony with nature as a Taoist recluse. Mohism or Moism (墨家; Mòjiā; Mo-chia; "School of Mo") was developed by followers of Mozi (also referred to as Mo Di; 470�c.391 BC). Though the school did not survive through the Qin Dynasty, Mohism was seen as a major rival of Confucianism in the period of the Hundred Schools of Thought. Its philosophy rested on the idea of universal love: Mozi believed that "everyone is equal before heaven", and that people should seek to imitate heaven by engaging in the practice of collective love. His epistemology can be regarded as primitive materialist empiricism; he believed that our cognition ought to be based on our perceptions � our sensory experiences, such as sight and hearing � instead of imagination or internal logic, elements founded on our capacity for abstraction. Mozi advocated frugality, condemning the Confucian emphasis on ritual and music, which he denounced as extravagant. He regarded warfare as wasteful and advocated pacifism. The achievement of social goals, according to Mozi, necessitated the unity of thought and action. His political philosophy bears a resemblance to divine-rule monarchy: the population ought always to obey its leaders, as its leaders ought always to follow the will of heaven. Mohism might be argued to have elements of meritocracy: Mozi contended that rulers should appoint officials by virtue of their ability instead of their family connections. Although popular faith in Mohism had declined by the end of the Qin Dynasty, its views are said to be strongly echoed in Legalist thought. The School of Naturalists or Yin-yang (陰陽家/阴阳家; Yīnyángjiā; Yin-yang-chia; "School of Yin-Yang") was a Warring States era philosophy that synthesized the concepts of yin-yang and the Five Elements. Zou Yan is considered the founder of this school. Their theories attempted to explain the universe in terms of basic forces in nature: the complementary agents of yin (dark, cold, female, positive) and yang (light, hot, male, negative) and the Five Elements or Five Phases (water, fire, wood, metal, and earth). In its early days, these theories were most strongly associated with the states of Yan and Qi. In later periods, these epistemological theories came to hold significance in both philosophy and popular belief. The School of Names or Logicians (名家; Míngjiā; Ming-chia; "School of names") grew out of Mohism, with a philosophy that focused on definition and logic. It is said to have parallels with that of the Ancient Greek sophists or dialecticians. The most notable Logician was Gongsun Longzi. The Taishigong Zixu (太史公自序) of Shiji (史記/史记) lists the above six major philosophies within the Hundred Schools of Thought. The Yiwenzhi(藝文志/艺文志) of Hanshu (漢書/汉书) adds four more into the Ten Schools (十家; Shijia). The School of Agriculture (農家/农家; Nongjia) encouraged farming and agriculture and taught farming and cultivation techniques, as they believed that agricultural development was the way to have enough food for the country. For example, Mencius once criticized Xu Xing (許行) for advocating that rulers should work in the fields with their subjects. The School of Diplomacy or School of Vertical and Horizontal [Alliances] (縱橫家/纵横家; Zonghengjia) specialized in diplomatic politics; Zhang Yi was a representative thinker. This school focused on practical matters instead of any moral principle, so it stressed political and diplomatic tactics, and debate and lobbying skill. Scholars from this school were good orators, debaters and tacticians. The Miscellaneous School (雜家/杂家; Zajia) integrated teachings from different schools; for instance, Lü Buwei found scholars from different schools to write a book called Lüshi Chunqiu (呂氏春秋) cooperatively. This school tried to integrate the merits of various schools and avoid their perceived flaws. Thus, the thought of this school lacked originality. The School of "Minor-talks" (小說家/小说家; Xiaoshuojia) was not a unique school of thought. Indeed, all the thoughts which was discussed by and originated from non-famous people on the street were included into this school. At that time, there were some government officials responsible for collecting ideas from non-famous people on the street and report to their senior. This was where this school originated from. This also explains its Chinese name, which literally means "school of minor-talks". Another group is the School of the Military (兵家; Bingjia) that studied warfare and strategy; Sunzi and Sun Bin were influential leaders. However, this school was not one of the "Ten Schools" defined by Hanshu. From the Taishigong Zixu of Shiji and Yiwenzhi of Hanshu the schools are developed from Zhou Dynasty officials. The Burning of books and burying of scholars banned people to keep most of their texts. The texts officially kept might be burned with the Qin Palace by Xiang Yu. From the Yiwenzhi, there are still many officially kept texts in the Former Han Dynasty, and some are written by Han dynasty people. The Wudi of Han ordered the study of the Confucian classics the basis of the government examination system and the core of the educational curriculum; there were little students to these schools except a few and many texts were lost later. Their thoughts can only be seen in the existing texts and newly discovered texts.